Wells Fargo CEO Says Bank Has Transformed; Lawmakers Are Skeptical Both Republican and Democratic lawmakers question whether Wells Fargo has changed its culture away from fraud and mismanagement that have led to billions in fines and penalties against the bank. Wells Fargo CEO Timothy Sloan faced hours of questioning Tuesday from both Republicans and Democrats on the House Financial Services Committee. 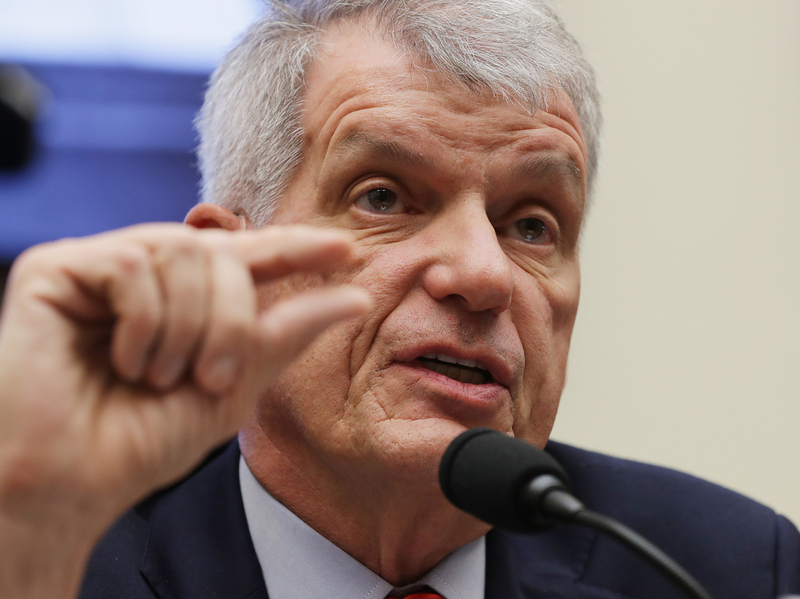 Wells Fargo has undergone a radical transformation since it was mired in scandals that resulted in billions of dollars in penalties and fines, the bank's CEO, Tim Sloan, told lawmakers Tuesday. But House Financial Services Committee Chairwoman Maxine Waters, D-Calif., did not appear to believe him. She called Wells Fargo "a recidivist financial institution." "Wells Fargo's ongoing lawlessness and failure to right the ship suggests the bank — with approximately $1.9 trillion in assets and serving one in three U.S. households is simply too big to manage," Waters said. Sloan faced hours of aggressive questioning from both Republicans and Democrats. They cast doubt on his claim that the bank had reformed since being caught opening fraudulent accounts and overcharging for mortgage and auto loans. They also pressed Sloan to account for a recent report that unethical practices persist with the bank's debt collection and mortgage origination. In his opening remarks, Sloan said his company has done away with high-pressure product sales targets that encouraged workers to open unauthorized accounts. The bank has also shaken up its board of directors and improved wages and benefits for its workers, Sloan said. He thanked lawmakers for letting him discuss "the progress we are making as we work to become the most customer-focused, efficient and innovative Wells Fargo ever." Rep. Patrick McHenry, R-N.C., asked the executive how many federal consent orders exist against the company: 14. "Each time a new scandal breaks, Wells Fargo promises to get to the bottom of it," McHenry said. "It promises to make sure it doesn't happen again. But then a few months later, we hear about another case of dishonest sales practices or gross mismanagement." It's been nearly three years since the unauthorized accounts scandal broke, when NPR and other outlets reported bankers had created deposit and credit card accounts for customers without their knowledge. Sloan said Tuesday that an audit revealed as many as 3.5 million unauthorized accounts had been opened. The Consumer Financial Protection Bureau ordered Wells Fargo to pay $185 million in penalties and fines in 2016 for creating those unwanted accounts. Sloan said the bank has made amends. He said it had made contact with some 40 million customers and had paid tens of millions of dollars in restitution. "Are you going to use your clever arbitration provisions, applicable to an account they never signed up for, in order to keep them out of court, if that's what they decide they want?" Sherman asked. "Congressman, our remediation for customers who were impacted by retail sales practices is extensive and comprehensive," Sloan answered. "And you refuse to let people go to court," Sherman countered. In another case, last year, the CFPB imposed a $1 billion fine against Wells Fargo for overcharging customers for mortgages and auto loans. In August 2018, Wells Fargo agreed to pay a $2 billion civil penalty to settle allegations the bank originated and sold mortgage loans that included false information in the years leading up to the financial crisis. As Sloan spoke, screens mounted on the committee walls projected excerpts from an article published Saturday in The New York Times; it revealed that debt collectors working for Wells Fargo in Des Moines, Iowa, were tasked with making 33 calls an hour and recouping some $40,000 in unpaid debts over the course of a month. Workers told reporters the goals were unattainable, similar to the ambitious sales targets that had driven Wells Fargo workers to open unauthorized accounts in the past. "The sales incentives have changed, not disappeared," the Times wrote, citing current and former employees. Asked about the report, Sloan said it was "inaccurate." Sloan spoke as his bank remains under an unusual Federal Reserve measure imposed last year to restrict its growth. The Fed said at the time that the company will be barred from expanding beyond its asset size in 2017, "until the firm makes sufficient improvements." The broad, bipartisan censure may provide a clue about future hearings by the House Financial Services Committee planned for other bank CEOs. Waters, who took control of the committee after Democrats won the House in the 2018 midterms, has pledged to more closely examine large banks. Sloan is expected to return to the committee to testify in April, as are heads of JPMorgan Chase, Citigroup, Bank of America, Goldman Sachs and Morgan Stanley, according to The Wall Street Journal. Waters' office did not confirm the report. On Tuesday, Sloan claimed Wells Fargo customers and workers were responding well to changes in the bank. "Our customer experience and loyalty survey results are now at their highest levels in the past 2 1/2 years," he said. Stephen Beck, founder of the CG42 management consulting firm that advises banks among other industries, said a study conducted by his company belies that claim. The firm surveyed U.S. banking customers in late 2018. Beck said Wells Fargo customers were the most likely to abandon their bank. "Their vulnerability is profound," Beck said of Wells Fargo customers. "One of the many critical frustrations ... is the dishonest, unethical and illegal practices they've engaged in." Still, Beck doubted the House hearing would lead to more drastic penalties on Wells Fargo, like breaking up the bank. "You could say it was a rough day for Mr. Sloan," Beck said. "But when you think about the wide range of issues they've had over the course of the last few years, and when you think about the relatively modest penalties they've received and the relatively modest changes they've made in light of those challenges. ... At the end of the day, these are just words."